The pair of painted scrolls, Kite and Crows (Kitamura Museum collection, Kyoto), is one of the most accomplished compositions by the influential painter and haikai poet, Yosa Buson (1716-1784). 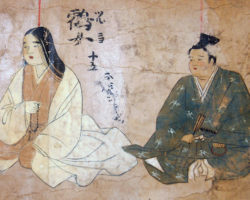 The images were executed in Buson’s later years in the mid-Edo period (1615-1868). In this lecture, we explore Kite and Crows from two perspectives: painterly style and poetic references. Buson was a great admirer of the elaborate and decorative style of the Chinese painter Shen Nanpin. 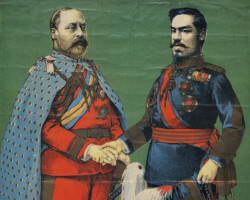 An extremely popular style during his time, Buson studied and incorporated Nanpin’s techniques into his own work. 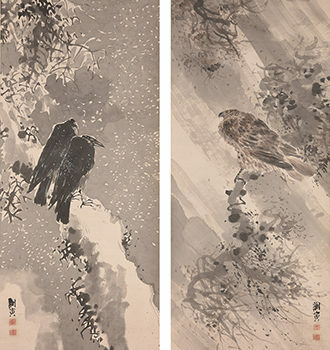 Kite and Crows not only reflects Buson’s attentive observation of the Chinese style, but also demonstrates his unique expressive intelligence. Buson was also a well-established haikai poet master. While Kite and Crows are based on poems by two prominent haikai poets, Matsuo Bashō and Mukai Kyōrai, Buson uses his own verse to embed his presence into the paintings so that the three avians depicted can be read to reference the three men of poetry. This lecture will provide a fresh interpretation of the Kite and Crows as a monumental work that sheds light on Buson as both an accomplished painter and a haikai poet. Takuyo Yasunaga is Researcher, Department of Art Research, Archives and Information Systems at the Tokyo National Research Institute for Cultural Properties (Tobunken), where he has worked since 2015. Prior to joining Tobunken, he worked as a curator at the Wakayama Prefectural Museum for 12 years. He specialises in paintings from the Edo period, especially literati paintings. His current research focuses on relationships between paintings and literature and between paintings and materials. He has published many scholarly essays on figures such as Yosa Buson, Goshun, Kuwayama Gyokushū and Noro Kaiseki, which include ‘Semegiai, keishōsuru, nihon no bunjinga: Kansai o chūshin ni (Conflict and Succession in Japanese Literati Paintings: Focusing on the Kansai Region)’ (published in Japanese).